Comments: Hatton Ferry is a poled ferry that crosses the James River at a site named Hatton about three and one-fourth miles south west of Scottsville, Virginia. James A. Brown, a storekeeper, began operating a ferry at this location in the late 1870's. In 1906, James Benson Tindall of Buckingham rented Brown's store and then purchased the ferry and store from Brown's descendants in September 1914. Tindall managed Hatton Ferry operations until 1940 when he deeded the ferry to the State of Virginia. Today in 2004, Hatton Ferry operates on a weekend schedule from April to October and is managed by the Albemarle Charlottesville Historical Society, Albemarle County, and the Virginia Department of Transportation. The Hatton ferryboat is flat-bottomed with a deck hovering a few inches above the waterline. A stout cable is attached to one of the boat's ends and guided by an overhead wire connecting the two river banks about 700 feet away. One cable allows the stern to swing gently downstream, following the current. The other retards a similar reaction by the prow, and together the cables control the craft in its river passage and harness the natural power of the river. The boat caught at an angle by the current, floats steadily across the river. As the ferry approaches the riverbank, the ferryman cranks a hand winch to roll up the cable at the boat's stern. With a few jabs of the ferryman's pole at the trip's end, the ferry slips onto its riverbank landing. In the 1910 photo above, Hatton Ferry is shown crossing the James River to the Buckingham shore. James Tindall and Eugene Layne, his business partner, rode in the buggy at the ferry's rear. Sarah Frances (Ripley) Napier (1833-1920) stood at the ferry's edge with her three grandchildren: Ethel 'Minnie' Napier (b. 1904), William 'Buster' Napier (b. 1906), and Monroe Napier (b. 1908/1909). When this photo was taken, Sarah's son and the father of the children, William Joseph 'Joe' Napier (1871-1947) was the ferryman at Hatton. At the front of the ferry, George A. Tapscott, a Civil War veteran and future father-in-law of James Tindall, drove the lead buggy. In the ferry's early years, its traffic consisted of wagons, buggies, horses, cattle, sheep, farm equipment, lumber, and farm produce. Men were hired to operate the ferry from 'sun to sun' seven days per week; each was paid a salary and furnished with a certain amount of groceries, flour, and sugar to support his family. Since 1906, ferrymen operating Hatton Ferry include Joe Napier, Bolling Bryant, Monroe Napier, Luther Randolph, Harvey Briddle, Raymond Hackett, and Ned Hocker. They became skilled at keeping the ferry afloat even with wagons heavily loaded with railroad ties destined for train pickup at Hatton Station. It was not hard to sink a ferry boat, and if the front end was loaded too heavily, the current took hold of the ferry and sent it straight to the bottom. One day, disaster was narrowly averted when the ferry was loaded with timber and donkeys. One of the donkeys, tied to another, tried to drink from the James and thus pulled both animals dangerously close to the ferry's edge. A quick-thinking ferryman cut the lines holding the donkeys together and saved the boat from a dangerous situation with an unbalanced load. Another ferryman, Harvey Briddle, who started as Hatton's ferryman in 1932, is noted for superb dedication to Hatton Ferry for many years; he was the main character in one of the most exciting stories in Hatton's history. 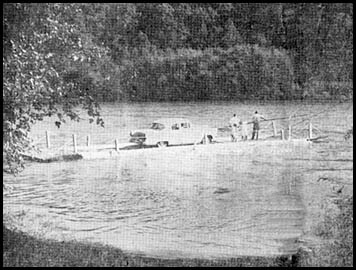 In 1940, the ferry broke loose from its moorings during high water and headed downstream in a debris-filled and raging river. Ferryman Briddle knew that replacing a boat was a huge expense and so set off after the ferry in a canoe. He caught up with the ferry, and, although his legs were crippled and he could not swim a stroke, Harvey hopped onto the ferryboat and tried to pole it to safety along the shoreline. The ferry poles, however, were not long enough to touch the river's bottom in the high water, and Harvey could not veer it from its course. As they approached Scottsville, Harvey was convinced the ferryboat would crash into the town's bridge abutment, and break in two. So he jumped back into his canoe and followed the ferryboat, which miraculously emerged unscratched on the other side of the bridge before beaching two miles further down river. Meanwhile back at Hatton, the Tindall family did not know what had happened to Harvey, a dear family friend; they feared he was dead. Jim Tindall, Jr., drove a truck to Scottsville to search for Harvey and bring him home, but returned later in the day without spotting the brave ferryman. About 5 p.m., the Tindalls gathered on their front porch overlooking Hatton and reminisced about their dear Harvey, whom they thought had drowned. Suddenly, the Tindalls spotted Harvey coming up the Hatton road and learned the rest of the day's story. Harvey finally caught up with the ferryboat and moored it safely two miles down river from Scottsville. Then he canoed two miles back upstream to Scottsville and caught a ride back home to Hatton. The Tindalls were thrilled to have Harvey, their beloved ferryman, safely home. However, the boat was destroyed by swirling floodwaters after Harvey returned home that day, and a replacement ferryboat was ordered and put into commission at Hatton several months later. In September of 1870, Buckingham County authorities issued a court order to maintain a public ferry across the James River to the Albemarle lands of Thomas P. Gantt near Totier Creek. Three years later, Gantt sold 18 � acres of river front property to James A. Brown, who built a small general store there. With the land purchase came the ferry rights established by Buckingham County. Brown, however, ran into trouble with the land owners on the Buckingham side of the river when they informed him and their county board of supervisors that they did not want ferry traffic across their property. Although Brown sought legal help, the Buckingham land owners continued to protest. In the late 1870's, James A. Brown rented a river front parcel of land, located three and one-fourth miles from Scottsville and belonging to S.P. Gantt of Albemarle County. Although Brown owned river front property near Totier Creek and operated a general store and ferry service there, landowners on the Buckingham side the river were adamantly opposed to the ferry traffic he generated across their property. Unable to turn that opposition around even with legal action, Brown moved his store and ferry upstream to its new site near Lock 24 of the James River and Kanawha Canal. He later purchased this land from Gantt in 1881, and the site became known generally as Brown's, Brown's Store, or Brown's Landing. 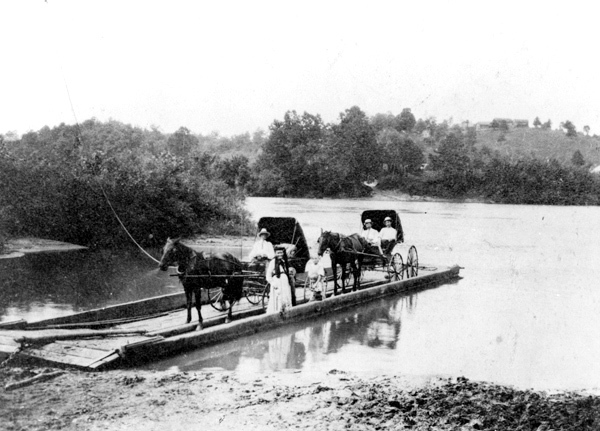 Over the next decade, Brown's became a thriving transportation hub on the James River. In 1881, Richmond and Allegheny Railroad established a train stop there. Two years later, Albemarle County authorized a public road to be built from Brown's Landing to an established county highway. A few months later, a post office began operation from Brown's Store. However, the post office's arrival necessitated a new name because there was already a Brown's Post Office operating in northwestern Albemarle; two Brown's Post Offices in the same county would have caused considerable confusion. Thus Brown named the post office 'Hatton' in honor of Frank Hatton, whose signature as assistant U.S. Postmaster General appeared on postal documents at that time. In 1889, the Chesapeake and Ohio Railroad took over railroad service through Hatton and erected a depot there two years later; they named it Hatton Station. By the late 1890's, Brown's ferry, too, was more commonly referred to as the 'ferry at Hatton' or Hatton Ferry. Each Hatton business thrived because of the totality of services provided at this location: timber and farm produce were ferried across the river and loaded onto freight trains at Hatton; at the store, ferry customers picked up mail and merchandise shipped into Hatton via train; and the ferry itself provided a vital transportation link between Buckingham and Albemarle Counties. When Brown died in 1896, Hatton operations were continued by Brown's daughter, Cora, and her husband, Edwin Raine until 1906 when James Benson Tindall of Buckingham rented Brown's Store. By 1909, Tindall was appointed Postmaster of Hatton and actively involved in Hatton station and ferry management. He enlisted Eugene Layne, an old Buckingham friend, as his business partner. In September 1914, Tindall purchased Hatton Ferry, the landing on both sides of the river, and all ferry boats, lines, and oars; the store, and about five acres of land surrounding the store and land. Jim's brother, Lewis Tindall, became his new partner in 1916 when Eugene Layne returned to Buckingham farm life. In 1940, Tindall deeded Hatton Ferry to the State of Virginia, who took over its operation as part of the state's system of highways. By 1970, the cost of operating and maintaining Hatton ferry exceeded its revenue, and there was much talk of discontinuing service by Albemarle and Buckingham, who shared the Hatton costs equally. In 1972, Hurricane Agnes destroyed the ferry and almost ended service. An interested public led by James Tindall, Jr., Peter Way, Raymon Thacker, Bernard Chamberlain, Daniel Van Clief, and other Albemarle citizens persuaded authorities to continue this historic ferry. A new ferry was built by the Virginia Department of Transportation, and it was rededicated in September 1973, with the assistance of Richard Thomas, star of the TV series, "The Waltons." 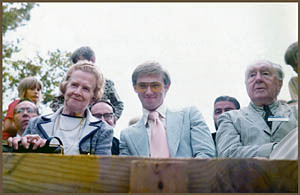 Shown at left is Richard Thomas seated between Mrs. Doris Hamner and Bernard Chamberlain of the Albemarle County Historical Society as they rode across the river on Hatton Ferry. 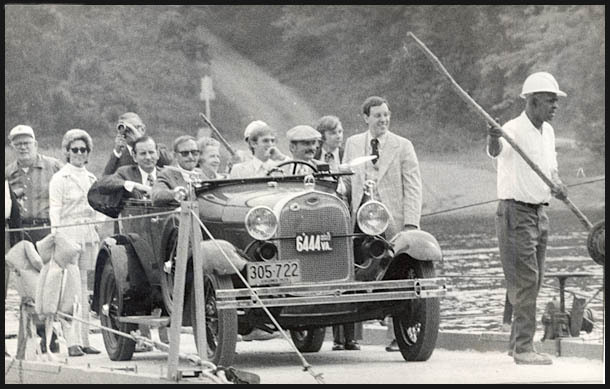 In this September 1973 photo, Richard Thomas rides across the James River in an antique car aboard Hatton Ferry. Beside him is seated Dorothy Hamner. Standing behind the car with a movie camera is James Tindall, Jr., with Bickie (Martin) Tindall. The ferryman for the dedication day was Ned Hocker, standing with ferry pole in hand at photo right. Hatton Ferry: When Ned Hocker was a boy, there was only one way to get from this side to that side of the James River: the pole ferry. The bridges were far apart, mechanically powered transport was source, and travelers hereabouts had to be pushed across the waterway by hand. Today, more than a half-century later, Ned Hocker is still at it. The bridges have closed in, the internal combustion engine proliferates, but Hocker continues to move traffic here at Hatton by stick. He runs the last pole ferry in Virginia; it may well be the last one in the nation. Oh, there are still a few other river ferries in operation. But they are driven by pistons and fossil fuels. The only help Hocker has is a 12-foot piece of pine; he plants the pole in the riverbed at the front of the ferry and then muscles the barge across more than 600 feet of rushing water. "What you do," he says, "is you walk from the front to the back of the boat and keep your weight on the pole. That's important, your weight. You can't just use your arms. You got to use the whole body. Then once you get going, you pick up momentum; it takes about three or four minutes." It also takes a sense of history. For the Hatton Ferry has been running continuously now, and over the same route since the late 1870's. The operation was started by a storekeeper, to facilitate early American commerce; he is said to have charged 25 cents for wagons and a nickel for pedestrians. And that's the way it was for nearly 70 years. Hocker said the toll was high, and the pay was low. When I was hired, I got $5 a week, and I worked 16 to 17 hrs. a day. Sometimes I made 50 crossings before noon. Back and forth. I remember I didn't have time to eat my lunch." Then in 1940, some alterations were made. The State of Virginia bought the ferry, the toll charge was quickly removed, and Hocker, the poleman, became a public servant. He presently works five days of the week, receives medical and other benefits, and he says he earns $11,000 per annum. Yet if some things have changed at the Hatton Ferry, other things have not. Hocker says the idea is still to push a 50-foot barge, loaded with 10,000 pounds of traffic, over sometimes troubled waters; the work is arduous, taxing, and tedious; it can also be quite dangerous. One danger is the steel cable that guides the ferryboat from shore to shore. It is only an inch thick, and under a relentless attack from the swirling currents. If it snapped, Hocker says it might whip along the length of the barge, and sweep everything and everyone into the deep. Then there are the various threats of Mother Nature. There are huge rogue logs, for example, that float out of sight beneath the river's surface, and there is ice in the winter that is honed like a knife; the ferryman claims the ice is sharp enough to cut the cable guide like a string. But the greatest hazard is the river itself. Hocker says it can be mean and cynical: "Sometimes it dries up overnight, and I got to worry about getting stuck in the mud. Then a week or two later it will flood. I've seen times I thought Noah would float by, standing on the ark." One such time was in 1972. That's when a hurricane ran up the East Coast, and the fury pushed the James River far over its banks. The raging water ripped the ferryboat from its moorings and washed it down river. It took days to make the repairs and put the ferry back in service. Actually, the state didn't want to put the ferry back in service. Despite its history, officials had decided that its usefulness was over. New bridges were handling most of the Hatton traffic, and the Virginia Department of Highways and Transportation tried to close the ferry for good. But residents of the region protested vigorously. They said the pole and the barge were as much a part of the area as the river they forded. A ceremony was held when the state relented. Hocker says so many people came to celebrate that he had to make 350 trips to accommodate them. Alas, that celebration may have been only temporary. Because Ned Hocker, now 68, is going to retire. He thinks he'll make his last crossing in January, and nobody is waiting in line to replace him. "I can't go on forever," he explains sadly; maybe the Hatton Ferry can't either. The 1910 photo of Hatton Ferry is part of the Edna Napier Nees collection; Edna is the great granddaughter of Sarah Frances Ripley Napier (1833-1920), who stands at the ferry's edge with her three grandchildren: Ethel "Minnie" Napier (b. 1904), William "Buster" Napier (b. 1906), and Monroe Napier (b. 1908 or 1909). Sarah's son, William Joseph Napier (1871-1947), was the ferryman at Hatton in 1910 and the father of the three Napier children in this Hatton Ferry photo. The other photos are part of the collections of James Benson Tindall, Jr., and Robert Spencer of Scottsville, Virginia.